DeAndre Hopkins has topped the 100-yard receiving mark in three straight games. 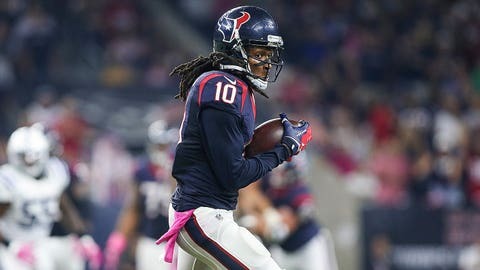 Houston Texans wide receiver DeAndre Hopkins, who already leads the NFL in receiving yards, has a chance to add on to his impressive season Sunday against the Jacksonville Jaguars. Hopkins, who is on pace set team records in receptions, yards and touchdowns, can tie Andre Johnson’s franchise record for consecutive games topping the the 100-yard receiving mark. Johnson accomplished the feat in four straight times, while Hopkins, who is coming off a 169-yard performance against the Colts, has topped 100 yards in Houston’s last three games. “He’s had an excellent start,” Texans head coach Bill O’Brien said, per the Houston Chronicle. “He’s worked very hard. There are a lot of things he can even do better. This team needs him." Hopkins leads the NFL with 578 receiving yards. NEWS: Want stories delivered to you? Sign up for our NFL newsletters.